Tape Torah Together and Love Forever! If you have a family with young children or a Sunday school class that is looking for a meaningful activity, try "Making A Tiptoe Torah". Children love the art and the connection with the Torah "that is inside the Ark". expression, please!) Or take turns reading. For older children, read separately before the discussion. ​The Illustration Page. This is another way for a child to personally connect with the Torah. Sweet Reward. Choose a reward earned after child has shared his or her answers. Fun foods or sweets are easy! Could also be an activity or event. Be creative. 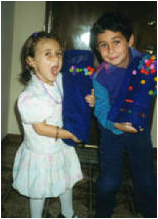 Children Love Their Tiptoe Torah! Take one empty paper towel roll. Tape blank piece of paper. 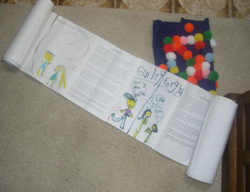 Creating a cover for the Torah can be especially fun for younger children. The one above was made out of felt and colored cotton balls. Have fun with it! Let your child truly make it their own. and inspire you to new heights of understanding, compassion and inspiration. What if my child doesn’t want to Tiptoe? Before you begin, make sure your child chooses his or her own special treat. Have the child be the first to answer question. Have child make up his or her own questions. What if children get squirmy during reading? They can draw the illustration during reading. It is okay to play with Plado or some other thing with their hands as long as it is not disruptive and they can answer the questions and participate nicely in the discussion. Remind them that if they can just hang in there a little longer they will get their treat. What if I don’t like or agree with my child's answer? If you keep an open mind, you will be surprised how much you will learn from your children.